— Friedrich Nietzsche, Aphorism 146, “Beyond Good and Evil: Prelude to a Philosophy of the Future” (1886). Withdrawing from daily society, limiting one’s view in a shrinking world by choice. Desperately craving what the world was and not what the world could be. Old, out of touch, and out of shape, he slowly retreats into the master bedroom, only seeing the world through the 16:9 aspect ratio of a flat TV, hooked up to a continental bird’s nest of silica pipes and fiber-optic cables, streaming miserably dim light. Divorcing himself completely from the well-being of others, only concerned with his personal comforts and beliefs, he will stop at nothing to keep his view of the world from being disrupted. The devil, and worst attributes of our society, reside in that dark room. Most of us make a choice to see a glimpse of that room during the holidays instead of going out and laying eyes on the spectacular places that are within our great country. We all lie to ourselves every day, and eventually all of us will end up in that room. During the shutdown of work that a lucky few enjoy the week between Christmas and New Year’s, my wife and I decided to take our two-year-old son on a cross-country road trip, from Houston, Texas, all the way to southern Arizona and Nogales, Sonora, Mexico. We did this instead of participating in the customary, family holiday events—an act that usually forces us to compartmentalize and deny our true desire, which is to pursue happiness and a feeling of freedom on the open road. We wanted to give our son the opportunity to make good on this American notion of happiness. We camped through 3,000 miles of the American Southwest, staying at six national parks and monuments: Guadalupe Mountain National Park, Organ Mountains-Desert Peaks National Monument, White Sands National Monument, Gila Wilderness National Forest, Chiricahua National Monument, and Saguaro National Park. Perhaps in an effort not to make the common mistake many fathers do—that of working on a floundering business instead of making time for their families—I felt it was important to go out and start to see the world as it actually is, with my family. I report back: it is beautiful beyond language out there, and I HOPE that you, too, find hope in these images. Unfortunately, that beauty is currently under threat by a right-wing kleptocratic dynamic, combined with a technology-absorbed culture. I urge you to get out and experience these places on your own, so that your soul can be filled with a fleeting glimpse of what infinity looks and feels like. On the first night, we stayed at Guadalupe Mountains National Park in Salt Flat, Texas. The drive from Houston was long; we left at 4:00 AM to make it out west with enough time to set up camp with daylight. The drive that day was a blur, but, as we made our way up near the park, we saw a strong presence of Trans-Pecos Pipeline activity, near Fort Stockton, towards Guadalupe Mountains National Park. With vast fields of burning gas wells and thrown tractor-trailer treads, there was a general feeling of non-regulated business activity. We did not make the stops to photograph those images as we burned through the iconic West Texas landscape, but those are on my mind. We stayed for one night—it was sublime—and left with an uneasy feeling of the bigness of the world, having slept at the bottom of what was once an ancient sea floor, while gazing at a star-filled sky that stretched seemingly to the beginning of the existence of the universe. The next day, we decided to make a push further into New Mexico and ended up staying at Organ Mountains-Desert Peaks National Monument. Along the way, we started hearing stories of the vast political struggles between the West and the Bureau of Land Management as we researched our route and listened to the local radio. After more than a decade of debate and submittals to Congress for approval, Organ Mountains-Desert Peaks (outside Las Cruces, New Mexico) was designated a national monument by President Barack Obama on May 21, 2014, using the American Antiquities Act. In January 2014, Interior Secretary Sally Jewell and Senators Tom Udall and Martin Heinrich held a listening session with the local community to hear their feelings and concerns. A poll was conducted in Doña Ana County, New Mexico, to find that 60 percent of local residents supported the measure to protect the 496,330-acre monument. The process to have the United States government designate this land as a national monument received significant support from local and state government, Native American nations, sportsmen’s groups, women’s groups, faith leaders, business organizations, and independent businesses. This open democratic dialog led Doña Ana County, New Mexico, to decide that they wanted to designate this nearby land as a park. Other cities supported the decision, notably the city of El Paso, Texas, located less than 50 miles away and with a diverse population that would also enjoy this site and monument designation. — Rob Bishop, Utah 1st District Congressman, Western State Land Commissioners Association Conference, Moab, Utah, July 19, 2015. Wallace Pratt, geologist ]and director of Humble Oil Company and Standard Oil Company, became so impressed with a piece of property on a vacation to the Guadalupe Mountain Ranch outside Van Horn, Texas, that he decided to buy it in 1921. As a geologist, he was fascinated by the ancient history of this land, a ]sea floor during the Permian Period (251-299 million years ago), known as the Delaware Sea. The rocks are ancient reef formations; El Capitan, the highest peak in Texas, is a limestone formation sitting on a foundation of coral latticework. Embedded in this ancient reef and basin sediment are the accumulation of plant and animal skeletons dating back more than 200 million years. In its rock caves, the site holds prehistoric Native American-settlement artifacts, dating back 10,000 years, when Clovis hunter-gatherers moved onto the land, following mammoth herds. To all of our great benefit, Wallace Pratt was lucky enough to find this land during a vacation and to be in a financial position to buy it. He also had the wisdom to donate the land to the federal government, following a congressional review process in 1960, so that they could establish the Guadalupe Mountains National Park in 1972. Not all national-monument designations have gone as smoothly as those for Organ Mountains-Desert Peaks or Guadalupe Mountains National Park. The American Antiquities Act has been challenged multiple times since Theodore Roosevelt passed it into law. One of the most memorable acts of opposition was the Sagebrush Rebellion of the 1970s and ‘80s, a response to the Carter administration’s protection of 157 million acres of Alaskan wilderness under the Alaska National Interest Lands Conservation Act (ANILCA). In recent years, this opposing force has lived around movements about eroding national rights in favor of states’ rights. Opponents are petitioning the United States government to abolish this federal law, which was designed to regulate the ability of private interests to destroy land that holds natural, scientific, or cultural value. In particular, House Representative designations made by the Obama (30) and Clinton (19) administrations. Notably, he has not gone after George W. Bush’s six national park designations.Rob Bishop from Utah has made a push to overrule the 49 national-monument designations made by the Obama (30) and Clinton (19) administrations. Notably, he has not gone after George W. Bush’s six national park designations. Bishop has crafted a narrative to call for abolishing the Antiquities Act, so that the federal government’s Bureau of Land Management (BLM) office has a stranglehold on large tracts of western land, making it impossible for the poorer counties of the area to access their own resources. The 13 states of the American West have anywhere from 22 to 76 percent of their lands managed by the National Forest Service or the Bureau of Land Management. He also has made the argument that the executive branch can unilaterally designate a national park without congressional approval and has falsely claimed that the BLM does not give land grants for oil or mineral extraction. Bishop is negating the fact that, in the case of Organ Mountains-Desert Peaks National Monument, there was a decade of local, state, and national meetings and hearings, as well as extensive congressional debate, before the designation was declared by President Obama in 2014. Bishop, who is the chairman of the Committee on National Resources, relies on out-of-state donors for 93 percent of his campaign contributions in his fight for “the little man” in Utah's 1st District. Some of the interests that invest in his campaigns—industries such as oil and gas, casinos, hotels, real estate, construction, mining and defense aerospace—give an indication of the world he envisions. His donor list shows not only an unwillingness to compromise with local groups but a corporate-backed sagebrush-rebellion push to eliminate federal regulation on lands that are priceless in their ability to display a national identity. A looming political question I have is: Why overrule Obama and Clinton’s national-monument designations and not Bush’s? Maybe the detestment lies in the choices made. Historically, it has been up to the federal government to enforce regulation on lands of significant cultural value. It feels as if Bishop is using out-of-state money to allow out-of-state interests a final say over local communities in their fight to keep natural treasures intact, erasing the America that was in favor of the easy version that they want to sell the public. This post-war 20th-Century narrative of America has forgotten the struggles of land-management regulation, erased all negative impacts that industrialized American life has projected on the planet, and freed its believers from any moral dilemmas, leaving the harsh consequences of those choices to their children and grandchildren. The history of America could just as easily be forgotten: Stonewall could be purchased by a commercial developer and be leased to Buffalo Wild Wings or Organ Mountains-Desert Peaks National Monument could become the next open-pit mine. 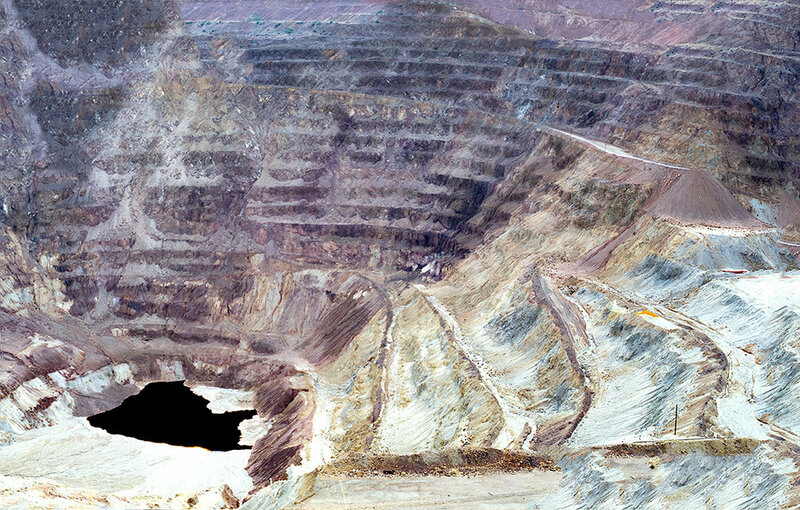 The Lavender Pit, located outside Bisbee, Arizona, was the endgame of the exploitation of the Copper Queen Mine, in operation from its 1885 acquisition by the Phelps Dodge Corporation, who ran it until it stopped yielding enough copper to be financially viable in 1985. The Lavender Pit was the brainchild of Harrison M. Lavender, who had transformed the area from an enclosed-shaft mine to an open-pit mine in 1950, as the rate of copper extraction began to decline. The result was a 300-acre hole in the ground, 900-feet deep, designed to process 600,000 tons of copper from hundreds of millions of tons of rock. In 2007, 22 years since the mine’s closing, the Phelps Dodge Corporation (a company that had been in operation since 1834, originally trading cotton to England and importing minerals needed for American industrialization) was absorbed in a friendly takeover by Freeport-McMoRan, Inc. A global gold and copper mining company, Freeport-McMoRan, Inc., ranks 41st among corporations in airborne pollutants emissions and is responsible for a series of payoffs to police, government, and military officials, in the sum of $20 million, to obtain a 95-percent ownership stake of the Grasberg Mine in Indonesia. In recent years, the Lavender Pit has been rebranded as a tourist attraction, complete with a mining-history museum, picturesque shops, hotels, and fine dining, transforming the local real-estate market of Bisbee, Arizona. — Stevan Pearce, U.S. Representative District 2, New Mexico. On U.S. Route 70, in between Las Cruces and Alamogordo, we came across a geologic formation called the Tularosa Basin, a graben (trench) basin, formed by fault lines pushing up adjacent rock formations, creating a center low point. Gypsum dissolves from the surrounding Sacramento and San Andres Mountains and slides down into the basin. Gypsum is water soluble and, usually, is carried off during rains to the nearest river and taken to sea. But, because the Tularosa Basin is fully enclosed, the gypsum is completely trapped, creating White Sands National Monument, the largest, gypsum dune field in the world. Over thousands of years, the soft clear crystals have become worn and scuffed and white from the friction of the elements. During the Pleistocene, two-and-a-half million years ago, this basin was a giant glacial lake, called Lake Otero, which later dried out at the close of the Ice Age, 11,000 years ago. In the 1940s, the White Sands Missile Range was formed for research and development preparations during World War II. Trinity—code named by John Oppenheimer and inspired by the Holy Sonnets of John Dunne—became the development site for the production of implosion-designed plutonium bombs, capable of yields equivalent to 22 kilotons of TNT or 100 terajoules of energy. Creating a blast radius of 3.5 miles, this type of bomb became the design for the “Fat Man” bomb that was dropped on Nagasaki, Japan, on August 8, 1945, killing 40,000 people instantly and another 40,000 with radioactive-induced illness—mostly leukemia. Since 1945, White Sands Missile Range has been the testing ground for the development of rocket-based delivery systems, like the German V-2 Rocket, and for Holloman Air Force Base, which employs 10,000 of the 30,000 people who live in Alamogordo, New Mexico, and is the home of the 49th Wing of the Air Combat Command. Since 1996, the German Luftwaffe has been operating the German Air Force Flying Training Center, training pilots and mechanics in the operation and maintenance of the American-made F-4 Phantom II fighter/bomber. In 2019, the Luftwaffe is scheduled to leave Holloman Air Force Base, taking with it a chunk of the local economy. On January 22, 2008, White Sands National Monument was placed on a tentative list of World Heritage Sites after letters of support for the application were written by U.S. Senators Pete Domenici and Jeff Bingaman; House Representative Gloria Vaughn; the mayor of Alamogordo, Donald Carroll; the president of the Alamogordo Chamber of Commerce, David Gottula; the mayor of Las Cruces, William Mattiace; and the director of the White Sands Missile Range, Thomas Berand. Opposition to the placement of White Sands National Monument on this list was led by Republican House Representative Stevan Pearce, tapping into fears that intergovernmental agencies like the United Nations would have the ability to manipulate United States military forces for their interests. Pearce rallied 1,200 petitioners who were supportive of the massive military industry operating in the Tularosa Basin to draft a letter of absolute opposition, demanding that White Sands National Monument be taken off the tentative list of sites to be considered for formal nomination by the United States. The Otero County Board of Commissioners officially passed Resolution NO. 08-23-07/96-10 on August 17, 2007, opposing the listing of White Sands National Monument to become a World Heritage Site, to protect the operations and development of missiles, fighters, and drone aircraft. Leaving White Sands, we drove north on I-25, through Hatch, New Mexico, to Caballo Lake, a reservoir on the Rio Grande River and the start of New Mexico Highway 152 West. We continued through the southern portion of the Gila, a 558,000-acre land defined as a wilderness by the Wilderness Act of 1964, and to the southern portion of the two-million-acre Gila National Forest. Gila Wilderness was originally occupied by Mogollon and Mimbres cultures, dating back to 200 CE, with cliff dwellings that date to 1,000 CE, nearly 600 years before the arrival of Spanish colonists. The area started being protected in 1899, as the Gila River Forest Preserve, by the General Land Office, an organization that oversaw the management of public domain lands since its formation in 1812 and used as its policy mandate the Land Ordinance of 1785 to regulate the sale of federal land to private citizens. This land ordinance was responsible for setting up a survey system that organized and settled the American West. In 1922, Aldo Leopold, the American writer and U.S. Forest Service supervisor of Carson National Forest, made the recommendation that the Gila River Headwaters should be preserved by a new administrative process of excluding roads and denying use permits for private businesses. This new process formed the concept of a legal wilderness definition, under which the Gila Headwaters became recognized as the first wilderness area by the National Forest System in 1924. As the administration became more defined, Gila became the first congressionally designated wilderness within the National Wilderness Preservation System, when the Wilderness Act was signed into law in 1964 by President Lyndon Johnson. — Aldo Leopold, A Sand County Almanac, “Land Ethic” (1949). The Chiricahua Mountains are an archipelago of sky islands in southeastern Arizona that connect the Sierra Madre Occidental mountain range in Mexico with the Rocky Mountains in the United States and Canada. Sky islands are high isolated mountains that have drastically different ecosystems from their uniform surroundings. The Chiricahua Highland is home to a high-alpine unglaciated environment surrounded by hundreds of miles of lowland desert plains.Its canyon walls have two contrasting ecosystems based on their relationship with the sun: one is a full-sun desert ecosystem; the other is a shaded pine-fir forest. Looking at this vast field of rocks, with rich red, orange, and neon-green lichen-encrusted rocks, I really felt the age of this place. The area was once an ancient volcano whose height of activity was during the end of the Mesozoic, contributing to the Cretaceous–Paleogene extinction 66 million years ago. The rock fingers of Chiricahua National Monument are a product of a subduction-zone formation under the monument, and, approximately 33-27 million years ago, a magma pool formed just below the crust of rocks and eventually ruptured, spewing 100 cubic miles of magma. This eruption compacted 2,000 feet of volcanic ash and pumice on the ground. The volume of material ejected was massive enough to cause the magma chamber of the volcano to collapse and form what is now known as the Turkey Creek Caldera. For the next 26 million years, faulting and erosion were the principal forces that sculpted the landscape. Uplift forced Chiricahua’s formations skyward, allowing millions of years of rain, snow, and wind to erode the rocks, shaping their current forms. Now, the rocks are worn unevenly along the veins of the 12,000-acre, balancing-rock hoodoo formations. I noticed that one of these rocks, balancing precariously in the air and being slowly and subtly eroded by time, had cultivated an entire civilization of fungus and lichens, as it awaited an inevitable fall into the shaded canyons below and a frigid decline. Reportedly, the first humans to gaze upon this site were the Clovis cultures, which came into this area approximately 11,000 BCE, after the Ice Age ended. Cochise cultures populated the area around 3,000 BCE. Later, from about 200 BCE, Mongolian cultures and the variants of Hohokam and Ancestral Pueblo cultures civilized this area and lived stably until the arrival of Spanish colonists in the 16th Century CE. I found myself reflecting on the totality of the human enterprise—constantly buzzing, never still—finding that this place makes every achievement made, every mistake, every attempt at expansion of empire seem laughably insignificant. I wondered about these rocks, as I wondered about the various cultural constructs formed by all of the world’s empires and the attempted projection of power to obtain wealth that each demanded. Those empires eventually collapsed, while these rocks have stood the test of time.